If you have to self-catheterize or if you’re cathing another person, you have probably been briefly taught how use catheter products by your healthcare provider. However, after you leave the doctor’s office and start using catheters at home on your own, you may have questions. We’re here to help. 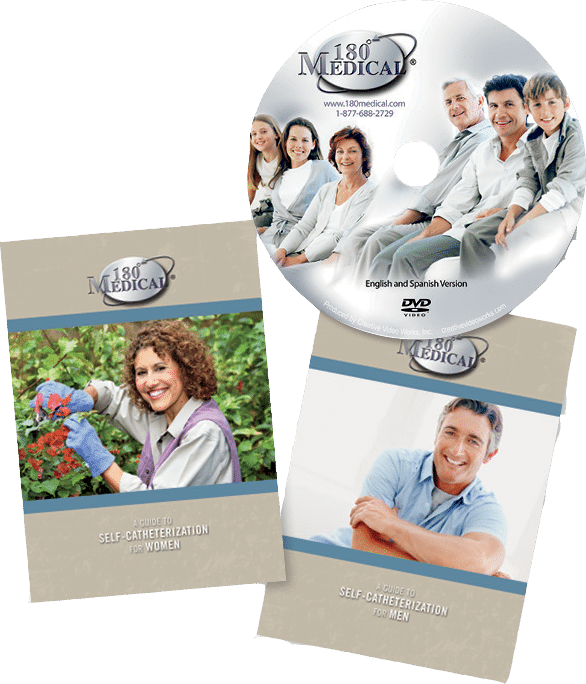 180 Medical has one-of-a-kind catheterization instructional materials available for you to help demonstrate the catheterization procedure including easy to understand catheter videos and catheter insertion instructions. Step-by-step instructions make the cathing process easier for you to understand. Printed instructional materials and DVDs are available upon request. We have separate materials available for men, women, girls, and boys. Contact us to get your instructional material today! Our staff of catheter experts are always available to answer any catheterization questions you may have or walk you through the cathing process. NEW! We now have an online portal for catheterization instructions for men, women, and children. Visit www.howtocath.com for more information.